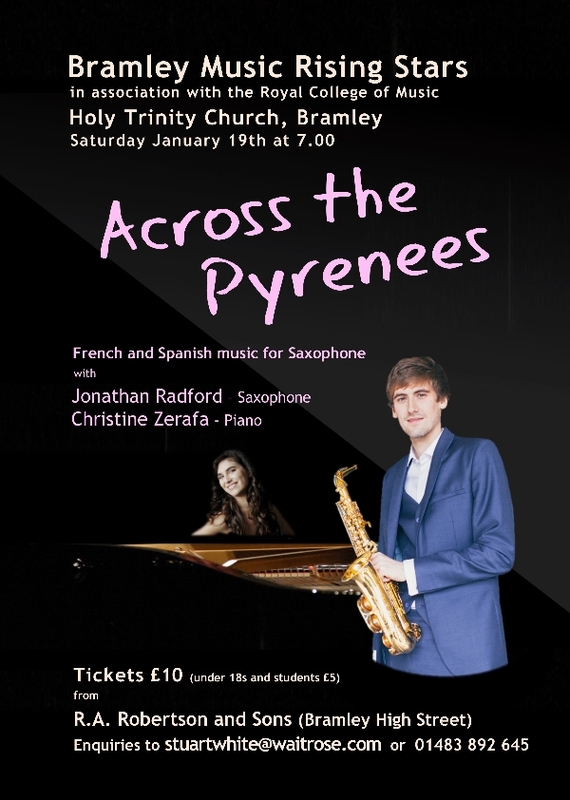 On Saturday 19th January at 7pm come to the 'Rising Stars' concert in Holy Trinity Church, Bramley, entitled 'Across the Pyrenees' – French and Spanish music for saxophone with fantastic young musicians Jonathan Radford (saxophone) and Christine Zerafa (piano) in association with the Royal College of Music and in support of the RCM Hardship Fund. This will be an exciting and colourful exploration of the cultural sympathy and musical styles of the two countries on either side of the Pyrenees, including music by well known composers Darius Mihaud (his popular ‘Scaramouche’), Manuel de Falla and Gabriel Fauré. In addition there are some lesser known but nonetheless superb composers to discover, and the climax is a ‘Fantasie Brillante’ on tunes from the much loved opera Carmen. As you can imagine, dance rhythms feature throughout, and this is sure to be a concert to get the pulses racing – just the thing for January! Tickets are £10 (students and under 18s £5) available in person from Robertsons in Bramley High Street; they can also be reserved via Stuart White (stuartwhite@waitrose.com or 01483 892645), and they will be available at the door. As usual there will be a free glass of wine or soft drink in the interval.